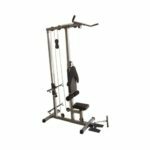 Home lat pulldown machines allow you to do two very effective back exercises, starting with the obvious lat pulldowns and the other being cable back rows. These exercises mainly target the back muscles such as the latissimus dorsi (lats), trapezius (traps) & rhomboids. Among those exercises listed above, there are also plenty of other good exercises including bicep & tricep workouts this machine will allow you to do. 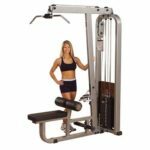 As a home lat pulldown machine can work multiple muscle groups, it means you won’t need a separate seated row machine or even a cable machine. 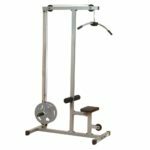 If you don’t already have an exercise bench then you can buy a weight bench that comes with a lat tower, eliminating the need to buy a separate lat pulldown machine. The quality of the lat tower that comes with the weight bench won’t be as good as the ones in the above table but you’ll definitely save money and also be able to do bench press exercises. 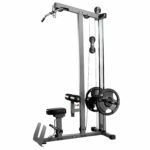 Choosing the best lat pulldown machine will allow you to get the most out of your back and arm workouts. It’s important to know what features you require as choosing the wrong one will probably just cause frustration, as little things like having to switch the cable when you change from lat pulldowns to back rows can be annoying for some people. Weight plate diameter – The diameter size of the weight plates that can be used, if you already have Olympic sized weight plates then you can simply use an Olympic sleeve adapter which will allow you to used Olympic sized plates. 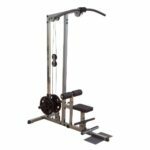 Seated back row cable – As well as a lat pulldown machine, most of them can also be used as a low row cable machine, where you sit on the floor rather than on the seat. You can work different muscles in your back by using different attachments. Cable change required – When switching from lat pulldowns to cable rows, some machines require the cable position to be changed and fed through the pulley at the bottom. This can be a bit of a hassle for many people as you have to go through this process every time you want to switch between lat pulldowns and cable rows. Fortunately most of the home lat pulldown machines require no cable switch so you can quickly switch from one exercise to another. Attachments included – Standard attachments that are included although we recommend buying additional attachments to make the most out of the machine. Seat height adjustable – Allows you to adjust the height of the seat according to your height and what’s comfortable for you. 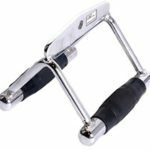 Adjustable rollers – Rollers help hold legs in place so your legs and hips don’t move around when you’re doing a set. The rollers are meant to sit on top of your thighs and as everyone has different sized thighs, having adjustable rollers will ensure any user will be locked in place. Maximum plate loading – Total weight of the weight plates the machine can support, the maximum weight would probably be sufficient for most people. Dimensions – Check beforehand whether you have enough space for this machine as it can take up a lot of room. Also take into account the length of the lat pulldown bar as it’s quite wide it requires space too. Warranty – If anything goes wrong with the machine the warranty would usually cover this if it’s a manufacturers fault. 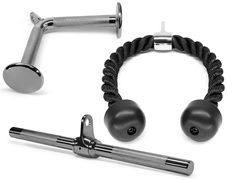 Tricep rope – Used for tricep rope pulldowns which is one of the most effective ways to work your tricep muscles. It can also be used for triceps overhead extensions. Tricep V-bar – Another method to work your triceps but perhaps not as effective as the rope as the rope has a wider range of motion. Although the V-bar targets the outer portion of the triceps, so using a combination of this and the tricep rope give your triceps more size. 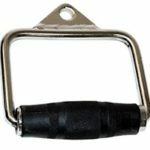 Single D handle – This can be used for a number of exercises such as: Single arm bicep curls, single arm tricep pulldowns, cable woodchop, single arm lateral raise, single arm cable row, plus many more! Double D handle – Probably one the best attachments to use for back rows, as it targets the middle back muscles, an area lat pulldowns won’t hit. When using it for back rows if you pull the handle closer to your chest rather than your core, it’ll work your traps more. Straight lat bar – An alternative to using the standard lat pulldown bar, the angle of the handles puts more focus on working your biceps. Bundle – If you want a few attachments then, you can grab a bundle which will include several attachments.